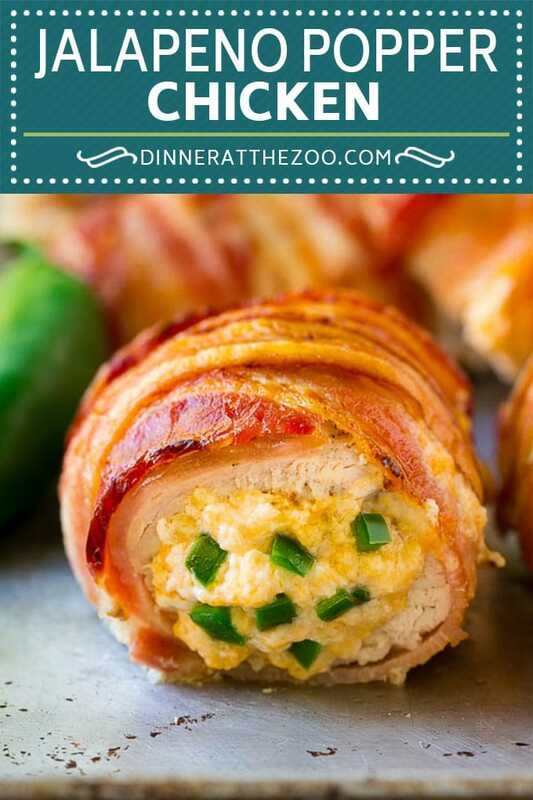 This jalapeno popper chicken is chicken breasts stuffed with a jalapeno cheese mixture, then wrapped in bacon and baked to crispy perfection. An easy low carb meal that’s a total crowd pleaser! I can’t get enough of jalapeno poppers – whether it’s bacon wrapped poppers, popper dip or jalapeno popper mac and cheese, I love it all! This jalapeno popper chicken is full of those great creamy and spicy flavors and looks impressive enough to serve to company. Jalapeno poppers are one of my guilt pleasures – I just love that creamy, spicy crispy combination. When you add bacon to the mix, it’s even better! This jalapeno popper chicken has all of those great flavors in a low carb, keto friendly dinner that will have everyone asking for seconds. How do you make jalapeno popper chicken? There are a few steps to making this chicken, the first of which is to make the filling. The filling is a combination of cream cheese, cheddar cheese, jalapenos and seasonings. I use fresh diced jalapenos, but you can use pickled jalapenos if you prefer. I remove the seeds and ribs before dicing the jalapenos which tempers the heat quite a bit and makes this meal more kid friendly. If you prefer a spicy chicken, leave the seeds and ribs in the peppers when you cut them up. How do you stuff a chicken breast? The cream cheese jalapeno mixture goes inside the chicken breasts. The easiest way to stuff a chicken breast is to cut a deep pocket into one side of the breast. Be sure not to cut all the way through to the other side. Spoon the filling into the pocket making sure you fill it completely. Then you can wrap your chicken in bacon and put it in the oven. 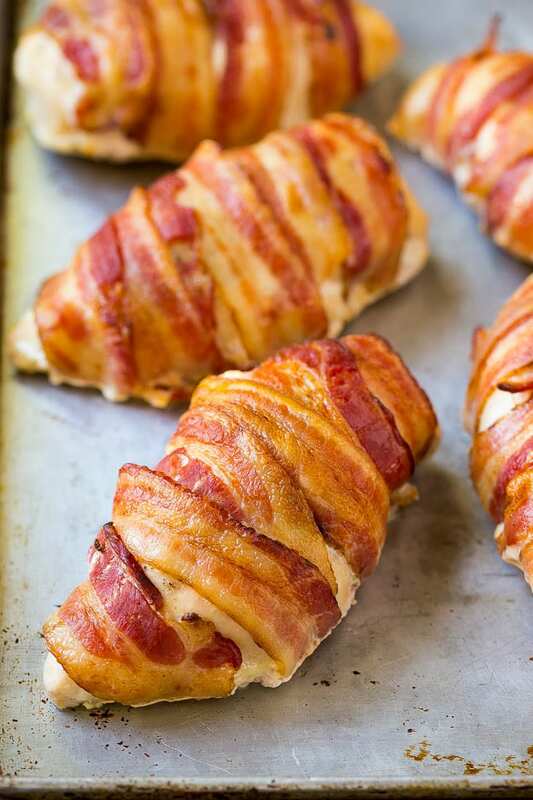 The bacon helps to hold that filling inside the chicken as it bakes, although some of the filling will escape during the cooking process which is normal. 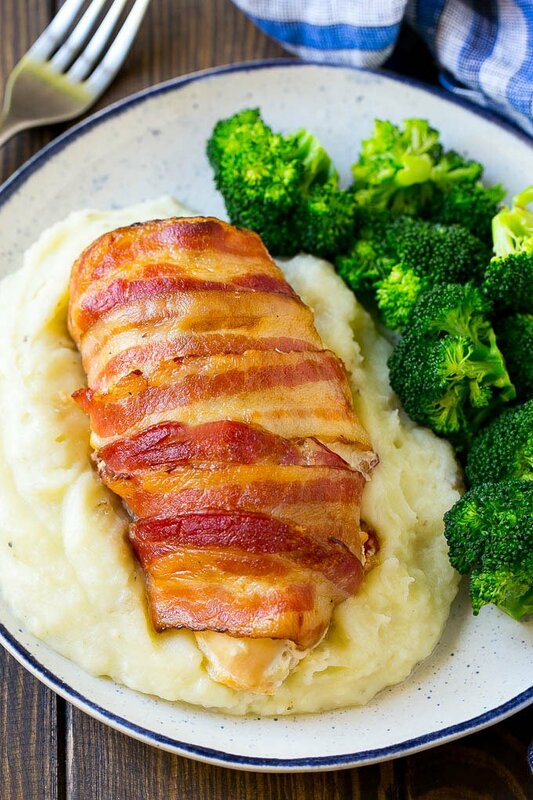 I use two slices of bacon to wrap each chicken breast, and you want to make sure that the bacon is wrapped fairly tightly so that everything will hold together in the oven. If you’re concerned, you can add a few toothpicks to secure the bacon to the chicken breasts, but I think it works just fine without having to use them. 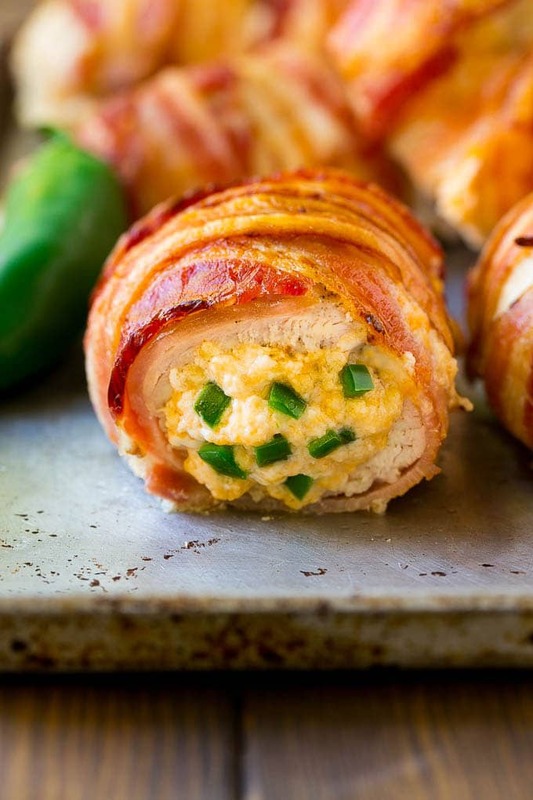 The jalapeno popper chicken needs to bake until the chicken is cooked through and the bacon is crisp. If your chicken is done but the bacon has not crisped up to your liking, you can turn on the broiler for a few minutes to cook the bacon. What do you serve with jalapeno popper chicken? I typically serve my jalapeno popper chicken over mashed potatoes and a green vegetable such as broccoli or asparagus. If you’re eating low carb, you can serve the chicken with mashed cauliflower. This chicken is even great sliced up and served over a salad or in a sandwich. Jalapeno popper chicken is a must-make recipe; that smoky bacon and cheesy filling just can’t be beat! If you love jalapeno poppers the way I do, you’ll definitely want to put this chicken on your dinner menu soon. This jalapeno popper chicken is chicken breasts stuffed with a jalapeno cheese mixture, then wrapped in bacon and baked to crispy perfection. An easy low carb meal that's a total crowd pleaser! 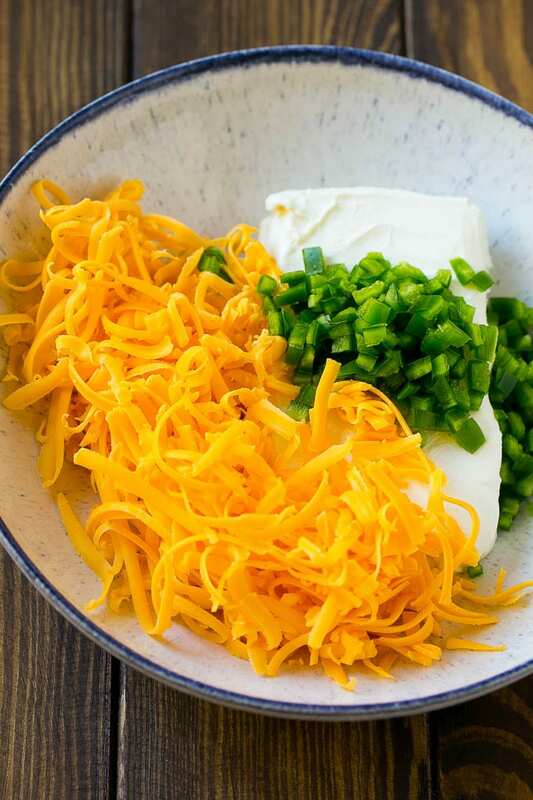 Place the cream cheese, cheddar cheese, jalapenos and garlic powder in a bowl; stir to combine. Cut a deep pocket into each chicken breast, taking care not to cut all the way through to the other side. 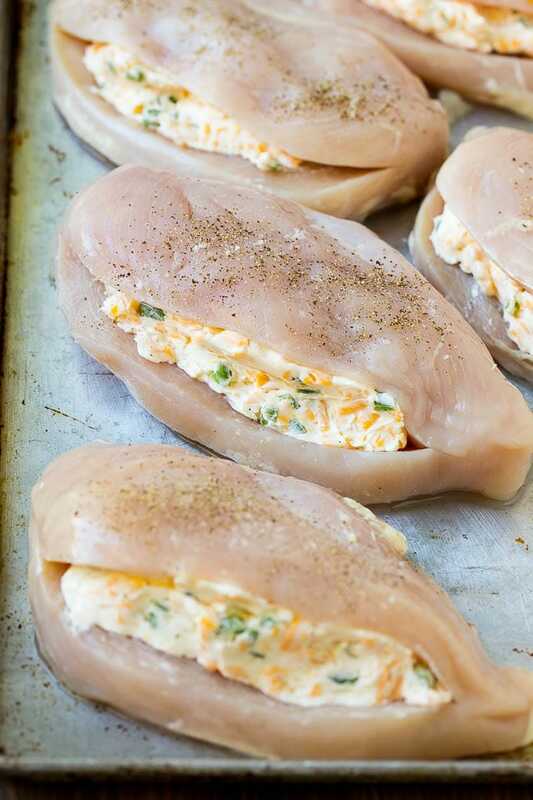 Fill the pocket of each chicken breast with the cream cheese mixture. Season the outside of the chicken breasts with salt and pepper to taste. 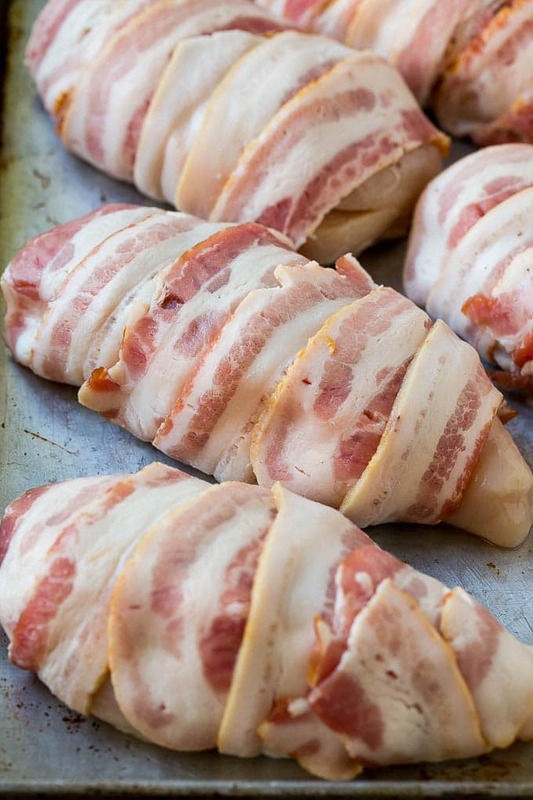 Wrap each chicken breast tightly with two slices of bacon and place the chicken on the sheet pan. Cook for 30 minutes, or until chicken is cooked through and bacon is crisp. You can broil the chicken for 3-4 minutes to crisp up the bacon if needed. Let the chicken rest for 5 minutes. then slice and serve. 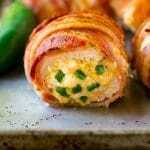 I love jalapeño poppers and this recipe is notch up including g chicken and bacon in it. Great work there. Omg can we say yum?!? I’m always looking for new chicken recipes. Must give this a try. I love jalapeno poppers and the fact that it is stuffed in chicken just makes it that much better. Really tempting, would love to try this at home! I am not big on jalapeño it’s not my personal favorite but I like this for a summer dish with margaritas. It seems like it would be a great party meal to have. And the bacon, yummy!! I think this will be a winner to our house. Thank you so much for sharing this tasty and delicious recipe! Omg these combine everything that I love into one! I need to make these soon! This looks amazing! I want some right now! Anything with cream cheese is on my love list! I think this would be such a delicious meal. Great recipe. I am sure my family would eat every drop. I love this idea and it looks absolutely delicious! What a wonderful meal idea for the family. Oh wow this looks so good! I’m definitely going to try these out for dinner. This again is unique, delicious and my ultimate pick, can’t wait to try this. Thanks. 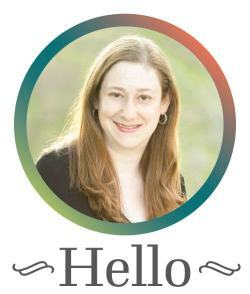 Like you, I am a really big fan of jalapeno poppers. This dish sounds so delicious, I am definitely going to be giving it a go. Your recipes never cease to amaze me with their delicious flavours 🙂 Yum! This may be my favourite! That is amazing! It’s like a game day appetizer in dinner form! I can’t wait to try this one.